In the frenzy of industrialization and urbanization in Japan in the second half of the 20th Century, countless villages were sacrificed in the name of progress. Wagatani was one of these tiny hamlets nestled along the banks of the Daishoji River in Ishikawa Prefecture that was swallowed up by a dam in 1965. 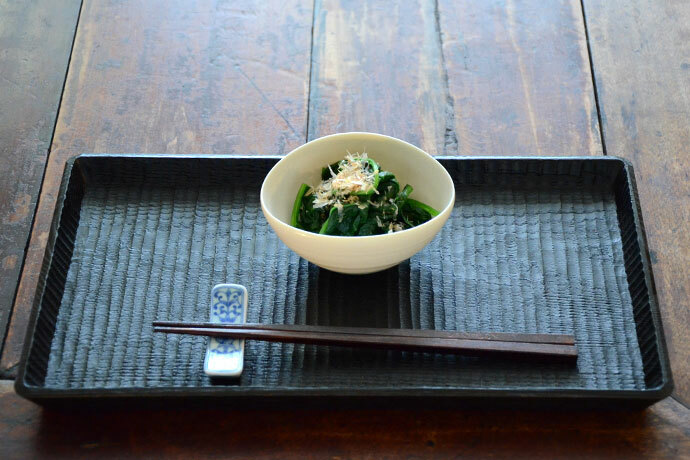 The village is remembered today through its distinctive style of tray called Wagata-bon. Wagatani, which means ‘my valley’, was located above the famous healing waters of the Yamanaka hot springs, which to this day is a popular tourist destination in Japan. The village had been in existence since the medieval pre-Edo period and its inhabitants were mainly woodworkers that made shingles, which was the preferred material for roofs in the Kansai region. 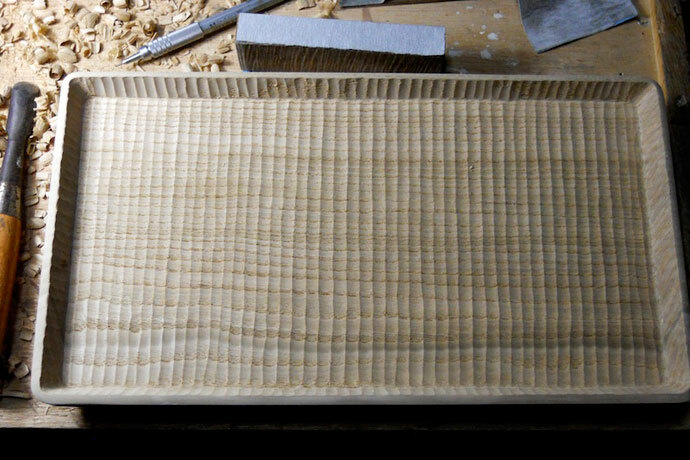 Towards the end of the Edo period, one of the village woodworkers named Nakasuji Tasuke began to carve trays out of the scrap wood that was left over from the shingle-making process. The tray, called Wagata-bon or Tasuke-bon for its distinct style, is typically made of chestnut wood that was abundant around Wagatani. Its rim and bottom are carved out of a single piece of fresh, un-dried wood and there are vertical chisel marks left on the tray. This style of trays appears to have been made by several woodworkers in the village and came in various sizes that depended on what scrap materials were available for use at the time. Very few of the original trays have been found outside the vicinity of Wagatani, so this suggests that they may have been locally bartered for food and daily necessities by the woodworkers. Kuroda Tatsuaki (1904-1982), a renowned Japanese Mingei wood and lacquer artist was a collector of these humble trays. He viewed the trays to be a pure example of Mingei because of their unintentional and simple beauty rooted in the daily lives of the local people. Kuroda sought to let the outside world know about Wagata-bon by writing about the trays in the September issue of Mingei-Techo in 1963, and encouraging the style to be revived by fellow artists. But just as Wagata-bon started to be recognized, the several dozen families that were still living in Wagatani began to move out ahead of the commissioning of the Wagatani Dam and the impending submergence of their village. The 1960s was an era that saw tremendous growth and prosperity in Japan, which led to considerable improvements in the living standards of a large majority of the Japanese people. But this progress came with a heavy cost to the environment, tradition, and culture. Many villages shared the same fate as Wagatani. One little known fact is that Japan has more than 3000 large dams, which for a country that is smaller in size than California is a remarkable number. By comparison, the U.S. has 9200 large dams and Canada has a little more than 1000. After the feverish building of so many dams, the public started to question their actual utility and this led to an official review of dam building and other pork barrel public works projects in the 1990s. Through the enduring efforts of woodworkers and Mingei supporters, a small part of Wagatani’s heritage has been preserved. As we look at the tray that woodworker Kobayashi Katsuhisa has faithfully recreated, we can reminisce about this village along the river in Ishikawa that supported the lives of many generations of woodworkers. Although the village is now gone, the soul of Wagatani village lives on in this unassuming wooden tray.